This is quite a nice Twin Burner Stove BBQ setup made by RidgeRyder. 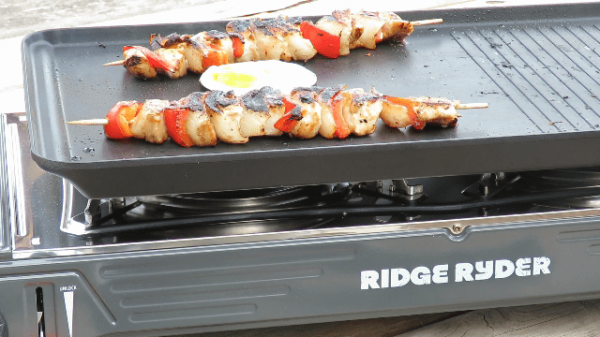 I put this dual burner RidgeRyder Stove to the test at Lysterfield Lake, in Victoria. The steel Hot Plate has an even spread of heat from the twin burners 8,000BTU each giving a total of 16,000BTU across the plate. Each side of the Stove has a separate Gas Cylinder, we had around 40 minutes of cooking time at around the 3/4 mark on the knobs. After cooking our lunch, there was approximately half of the gas left in the cylinder. One thing to remember when you go to National Parks for a BBQ, some will not permit solid fuel burners, so this is where this portable gas stove really proves it's worth. No Solid Fuel BBQ's Allowed Sign at Lysterfield Lake. Owning a Portable Gas BBQ Stove is your legal option to have a nice hot meal in these National Parks that prevent solid fuel burning. Having the ability to pull up, find a picnic table, and basically start cooking where you sit, is something I really enjoyed. My thoughts on this cooker. It performed quite nicely in mild windy conditions at Lysterfield Lake Park in Victoria near where i live, as seen in my YouTube Video above. The cost of Ridge Ryder Gas Cartridges are very affordable from SuperCheap Auto. I definitely give this product a Thumbs Up.